Although it feels solid and hard beneath our feet, the outer surface of the Earth is a thin crust of fragile rock, fractured like the cracked shell of an egg. 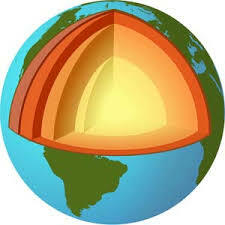 The pieces of the shell are Earth's tectonic plates -- there are 12 major ones -- and they float across a layer of soft rock like rafts in a stream, their motions driven by forces generated deep in the Earth. At their boundaries, the plates spread apart, converge, and slide past one another. Forces in the Earth cause its surface to change over time. These animations were originally produced for the US Geological Survey video Secrets in Stone. They have been converted to animated gifs for web display. You may use these animations for any educational purpose, we simply request that you cite the US Geological Survey as their source. Most people know that Earth is moving around the Sun and that it is constantly spinning. But did you know that the continents and oceans are moving across the surface of the planet? Volcanoes and earthquakes as well as mountain ranges and islands all are results of this movement. 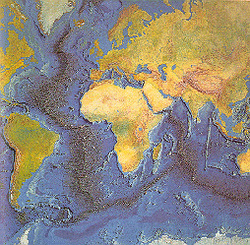 Less than 100 years ago, many scientists thought the continents always had been the same shape and in the same place. A few scientists noted that the eastern coastline of South America and the western coastline of Africa looked as if they could fit together. Some also noted that, with a little imagination, all the continents could be joined together like giant puzzle pieces to create one large continent surrounded by one huge ocean. Find out more about our earth. The earth — think it's solid as a rock?Our planet might seem fixed and rigid, but a closer look reveals that it is constantly shifting under our feet. About how many centimeters do the plates move a year? Where is Alfred Wegener from? What does the word Pangaea mean? Find out about our earth and how it changes. The Earth formed over 4.5 billion years ago, and it has been changing ever since.